It’s garage sale time! A lot can go into a successful garage sale, and it can be tough to figure out where to start. We’ve put together our top garage sale tips to help you navigate this process more confidently. Pick a good location. If you don’t live on a frequently-traveled road, consider having your garage sale at the home of a friend or family member instead. 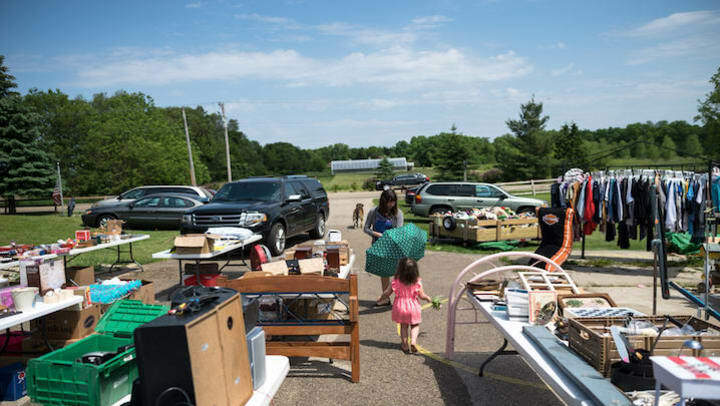 This also opens up opportunities for joint garage sales, adding to the total amount of items and adding more variety, both of which can attract more customers. Choose your timing wisely. Choose a weekend that has a good weather forecast and a time when people are likely to be in town. Also, consider any neighborhood or community events going on. If there’s something going on in your neighborhood that will attract more foot traffic, choose to have your garage sale that weekend. However, if there’s a big event in your community that would overshadow your garage sale, move the date to a more convenient time. Start early and go as late as you can -- and consider spanning your garage sale across an entire weekend, including Friday (think of it as an “early bird special”). Bring in some reinforcements. Ask your family members and friends for some help, and even offer an incentive: pay them a portion of your earnings or allow them to sell items as well. If you have more people helping out, you’ll be able to greet every guest, have better conversations about your items, and even stay open longer. Plus, you can make it fun! You and your friends can catch up and relax in between guests so it feels less like a burden or a job. Create clear signs. Market your garage sale by putting up signs throughout your neighborhood and surrounding areas. The most important thing here is to make sure they’re clear; there’s nothing worse than a garage sale sign that doesn’t show where or when it’s being held. Add in your address, the date and time, and a short description of what you’ll be selling: “baby clothes, toys, furniture, and antiques in great condition!” Put signs up the week before your garage sale to give people plenty of time to notice and make plans. Explore other marketing options. Use word of mouth and tell your neighbors and friends to spread the word. If your neighborhood has a bulletin or newsletter, explore your options of taking out an ad or promoting it there. Post online where plenty of people will see it - on your own social media page, a Facebook Marketplace page, NextDoor, or any other local neighborhood platform. Prepare in advance. Don’t try to throw together a garage sale overnight. Begin organizing and preparing items a few weeks in advance. This will help you determine your setup needed, including the number of tables you’ll need, the location of your garage sale, and whether you’ll need a tent or any other items. Plan exactly where everything will be and have it all ready to go before your garage sale starts. Price strategically. Garage sale shoppers are looking for deals, so make sure they feel like they’re getting one at yours. The general rule is 50-30-10. That means new, unused items get priced at 50% of their retail cost, slightly used items go for 30% of retail, and used items go for 10% of retail. People also love packaged deals, so if you have multiple similar items such as DVDs or clothes, bundle them. Buy one, get one deals are great, and so are 10 for $10 deals. Keep in mind that if people feel like your prices are too high, it’ll be tough to sell anything. Try to sell many low-priced items rather than a few high-priced items. Place strategically. Place the really attractive items and the best deals upfront so people driving by can see that your garage sale is worth it. Also, ensure your items are organized and that there’s a system. Keep children’s items separated from power tools, and the outdoor items separated from nice furniture. This will help people find what they’re looking for (or what they didn’t know they needed!) without feeling like it’s chaotic. Try it again. If your garage sale isn’t a huge success, don’t worry. The good thing about garage sales is that theoretically, you can have one at any time. Sometimes your garage sale gets rained out despite the 0% chance of rain. Sometimes people just don’t come. Sometimes the right people don’t come. Pack it up, reprice some things, and have another garage sale again next week. Don’t give up on the garage sale life if this one doesn’t go as planned!